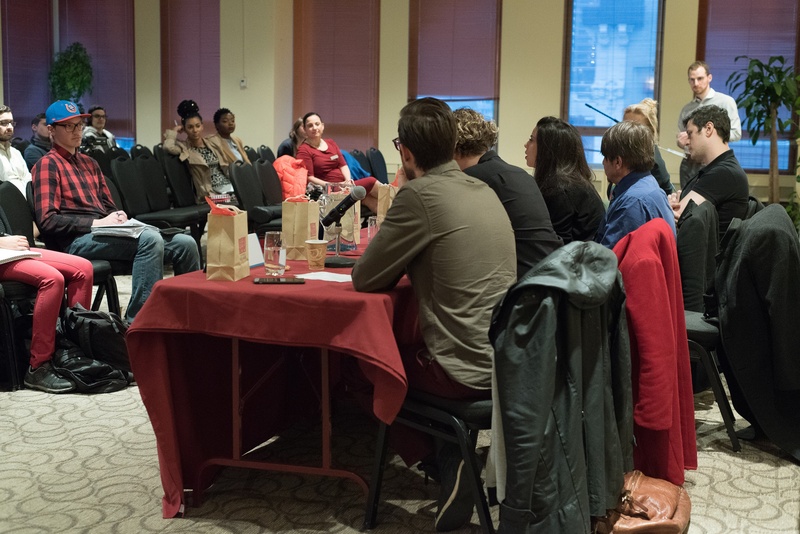 Six panelists spoke about their experiences as social entrepreneurs- people who start up businesses with the aim to solve or improve certain social problems- at a talk at Concordia on Nov. 16. The six speakers included Kim Fuller, the founder and creative director of Phil Communications; Sydney Swaine-Simon, the co-founder and international director of NeuroTechX; Thérèse Regenstreif, the program manager of Mining Shared Value; André Boisvert, the general manager of ZAP; Jessica Newfield, the chief communications officer of Grey-Box; and Jason Dominique, the executive director of Testicular Cancer Canada. The panelists offered in-depth insight and information regarding their views on the business model of self-sustainability through donations, and working for a cause rather than primarily for profit. The social entrepreneurship model practiced by these six individuals is a sort of middle ground between charity work and for-profit business. On the one hand, these entrepreneurs want their businesses to prosper and make a profit. On the other hand, they want to achieve that profit in a moral way, as they contribute to causes and issues they care about. “I quickly realized after volunteering for [nonprofit] organizations… that there were cycles of dependency [on money] and I realized that the nonprofit sector, even though it is well intentioned… [isn’t] the most effective in actually bringing about community change,” said Newfield. Newfield is currently working on Grey-Box, a small, portable computer that can be solar-powered and connected to Wi-Fi networks. The social entrepreneurs spoke about how they see their profession as a more pragmatic version of charity. They explained the challenges social entrepreneurs face are similar to those for-profit businesses and charities face. “We’re still not perceived really as a legitimate business… It really ticks me off that, when I talk to people about the kind of work I do, they’re like ‘aw, it’s so sweet. Look at you, you’re such a do-gooder.’ No, it’s a business—I’m in the business of helping people who help people. That’s a lot of responsibility. There’s nothing ‘cute’ about finding out that your client, who runs a women’s shelter, has to close on Saturdays and Sundays because of budgeting cuts,” said Fuller. While all of these entrepreneurs acknowledged that the path they’ve chosen is difficult, Regenstreif summed up why they all continue with their work. “If you guys choose a certain path because you think it’s a safe path or it’s a guaranteed path that’s going to bring you ‘x’ amount of money, there are no guarantees,” she said.